Canine skin tumours are often harmless or benign but of course some dogs tumours will become malignant and require treatment. Unfortunately malignant canine tumours will spread throughout the body causing damage to organs and tissue. Because of the seriousness of tumours it is important for the dog owner to be able to recognise the symptoms that may indicate malignant canine tumours. Canine skin tumours reveal themselves as a 'lump' or 'mass' of skin. These lumps will usually grow over time and can become very large indeed. In some cases however the mass of skin will not expand to vigilance is required. If you can see or feel a lump of skin and it doesn't grow don't think that it is therefore harmless. It still needs to be checked out by a vet. Other symptoms include hair loss with the dogs hair dropping out from the affected area. The mass of skin may also leek fluid which is an obvious sign that the dog is in distress. 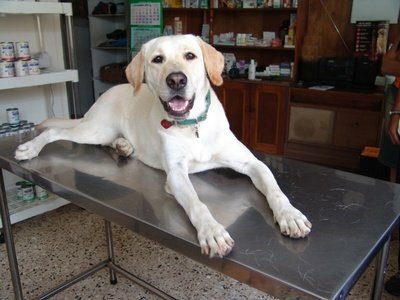 Before prescribing treatment the vet firstly needs to determine the type and seriousness of the dogs tumours. It may need for than the initial visit to the vet to determine the cause of the lump as its growth may need to be monitored over a period of time with a visit to the vets every two weeks or so. However, the initial consultation will reveal some important indictors. For example, is the growth attached to tissue? Does the appearance of the tumour give any clues? An accurate diagnosis may need cells to be extracted from the dogs tumours to determine if the tumour is benign or malignant. In some cases the vet may need to perform a biopsy. This is a surgical procedure is which a piece of the tumour is removed and sent to a lab for analysis. Biopsy's are usually performed when cancer is suspected. As we have mentioned many tumours will be benign and they can be removed quite safely with the dog quickly recovering from his ordeal. Unfortunately, dogs tumours that are malignant can mean that the dog has to undergo a long period of treatment though, inevitably, some tumours will not be treatable and the dog will have to be euthanatised.